News & Trends> White Papers > Hydraulics - Pneumatics > Electric Submersible Pump Systems serve diverse applications. Electric Submersible Pump Systems serve diverse applications. 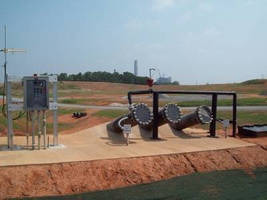 ANN ARBOR, Mich. -- Environmental Pump Solutions (EPS) has been acquired and is now part of QED Environmental Systems. Through this new addition, QED now offers an array of attractive electric pump solutions to complement its well-known line of AutoPump® air-powered pumps. EPS is a Pennsylvania-based manufacturer of electric submersible pump systems used in landfill, mining, oil and gas, construction, marine, and municipal applications. They have over 3,000 successful installations in over 500 landfills, mines, and other sites in the U.S. and Canada. EPS offers complete pump systems, including in-stock control panels featuring unique smart controls designed for ease of use. Their sideslope riser pumps for landfills feature robust HDPE housings for ease of installation and removal, without the breakdowns and problems of wheeled pump carriers. All pumps include environmental-grade motors for longer life. All control panels include circuit breakers for pump and motor protection, and have options for flow meter displays, alarm beacons, computer/telemetry operation, and auto dialer with cellular service. Building on EPS' excellent reputation for high quality products and superior customer service, QED is already increasing inventory levels and strengthening customer support across the entire U.S.
EPS operations have relocated to QED's Dexter, Michigan facility, and key EPS employees will continue to lead this part of the business. This is a great opportunity to expand QED's capabilities in remediation and landfill pumping for our current customers and new clients. To learn more about EPS, please go to www.environmentalpumpsolutions.com and, for more information on QED and all their Innovative Environmental Products, visit www.qedenv.com. Sideslope riser pumps for landfills feature HDPE housings for facilitated installation and removal without breakdowns or problems associated with wheeled pump carriers. All pumps include environmental-grade motors for longer life, and all control panels include circuit breakers for pump and motor protection. Options are available for flow meter displays, alarm beacons, computer/telemetry operation, and auto dialer with cellular service.